After receiving a bunch of cute little Persian cookie cutters from my in-laws, I wanted to put them to use. I made Persian chickpea cookies called nan-e nokhochi. 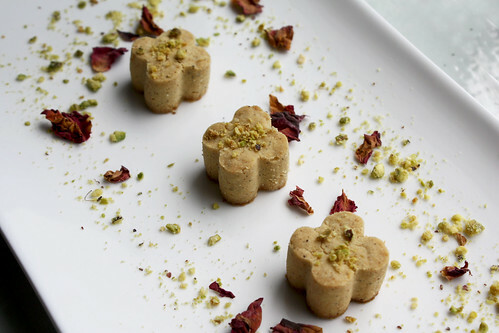 Nan-e nokhochi is a delicate cookie that is made from very fine roasted chickpea flour. They crumble and melt as soon as they enter the mouth, and the cookies pair well with tea. I once tried using regular chickpea flour from my local bulk store, but it just didn't taste the same. The delicate flavor is lost, and a lot more butter/oil is needed. You can find roasted chickpea pastry flour at any Persian grocery store. In Ottawa, I get mine at Arya Food Market. This recipe makes approximately 60 mini cookies. 1. Preheat the oven to 300 degrees F. Combine the chickpea flour, confectioners sugar, and ground cardamom. Mix until evenly distributed. 2. Slowly add in the butter/oil and mix well. Add the rosewater, and continue to mix well. 3. Tightly pack the flour mixture into a small rectangular pan that is 3/4 inch high. Cover with plastic wrap and refrigerate for one hour to harden the dough. Remove from the refrigerator. Cut the dough with a small cookie cutter that is 3/4 inch wide and 3/4 inch high. Place cookies on a baking sheet, spacing them one inch apart. Garnish with crushed pistachios. Bake in the oven for 20-25 minutes, or until the base of the cookie is slightly golden. Allow the cookies to cool before transferring them. As mentioned, they crumble very easily. 4. To create more cookies, repack the dough and repeat step 3. Be sure not to over bake your cookies. Doing so will create a bitter taste. I love Persian chickpea cookies!!! 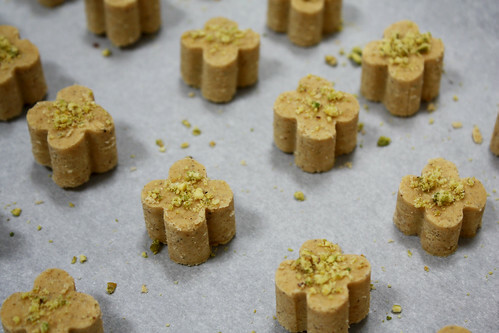 I tried these cookies at my Persian friends' dinner and hooked on them. The taste resembles Malaysian nut cookies made with ghee and so I googled a bit and baked a bunch at home and ate them all in a day. I also made them less sweet. They are heavenly! I can't wait to try these! Thanks so much. These cookies are sooo cute! And gluten-free, wow. Could I roast some Bob's Red Mill chickpea flour myself, or would that not work? You could roast Bob's Red Mill chickpea flour yourself, but the flour itself may not be as fine as the pastry flour you would find in a Persian store. I'm not familiar with Bob's Red Mill chickpea flour, so if you do end up trying it, I'd love to see how it turned out! Thanks for allowing me to feature your cookies on The Cookie Blog! My readers loved them! where can you get chick pea flour from? You can get roasted chickpea pastry flour at a Persian grocery store, or a Middle Eastern one. If not, try going to your local bulk store for regular chickpea flour and lightly roast that yourself. About 10-15 minutes at 100F should be ok. The only difference is that it won't be as fine as the pastry flour you will find at a Persian grocer. I'm wondering if this is normal or maybe I should add more clarified butter? We've been eating the crumbs and bit anyways cuz they are sooooo tasty! Yes, the only downfall about making these cookies is that they are very delicate. My cookies also get stuck in the cookie cutters and I have to gently push them out without breaking them. There are two things you can do to prevent the dough from cracking so easily. 1. Re-pack the dough tightly and stick it in the fridge for a longer time to harden the dough. 2. Add more clarified butter. If I need a quick fix, I'll usually do a combination of 1&2. I'll add a bit of butter and then re-pack the dough and stick it in the fridge. I just made Tut for a friend, and bought my rosewater at Arya, where I went for the first time. Of course, rosewater can be found in many grocery stores, but I wanted to visit this one after reading one of your posts. Norouz beeing in only two days, I was charmed by the children choosing their goldfish and the women buying flowers, and huge amounts of dried fruit and nuts. This will definitely become one of my favourite stops! Now, for my next mission: baking some Nan-e Nokhochi for the first time, because I just love chickpea cookies! All out of cardamom and rose water, I found they also come out well with a few teaspoons of almond extract. You must be an angle for posting this recipe! I had these cookies ONCE many years ago and have never forgotten them. On a whim today I did an internet search for chickpea cookies and there they were! Thank you so much. Freshly ground chick peas into flour have a beautifully delicate and subtle flavour. Besan flour or chick pea flour you buy might be cut with split yellow peas - which will make the flour bitter or if the flour is a little aged, it will also taste dull and a little bitter. Best to grind your own flour as the taste is unbelievable!! Tweet! Copyright 2012 Nooschi. Simple template. Powered by Blogger.